Wow….lots harder than I’d imagined. I mean, I’ve left her house to move to different places we’ve lived a LOT before – GA, TX, AL, AK, IN, all sorts of places….. just never to the other side of the planet. But we’d figured out how to Skype from her house, and how to email and use facebook’s messenger service, so she was feeling pretty dang connected, I think. I was still really disappointed that I didn’t get to see my sisters before I left, but they have fairly young families, I guess, and were very busy. Perhaps next time. The morning was cold, there had been snow flurries the night before, and I was hoping for a clear travel day since my snow-driving skills were rusty. 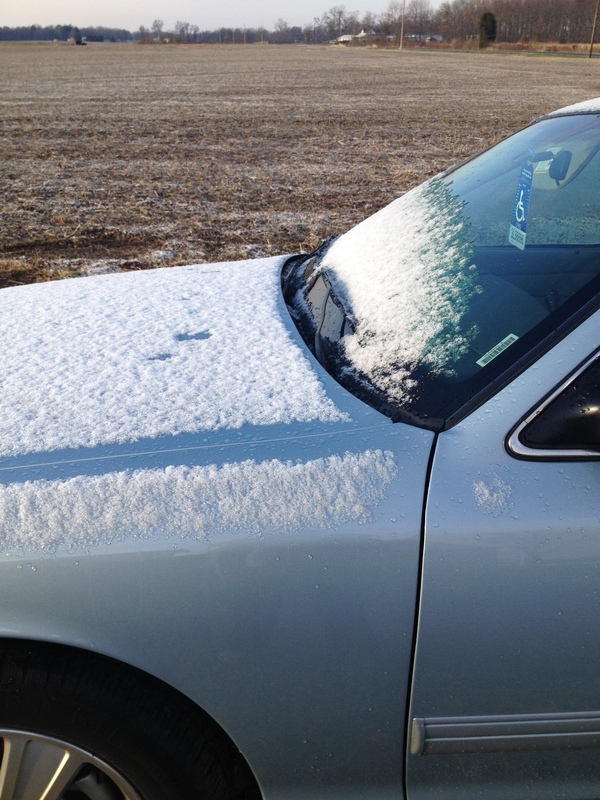 Pretty lucky, just a smattering of snow was left on the windshield of the rental beast. Robert drug all the luggage to the end of the new sidewalk so we could stash it in the trunk – man, this sure looks like an awful lot of stuff to be taking, right? 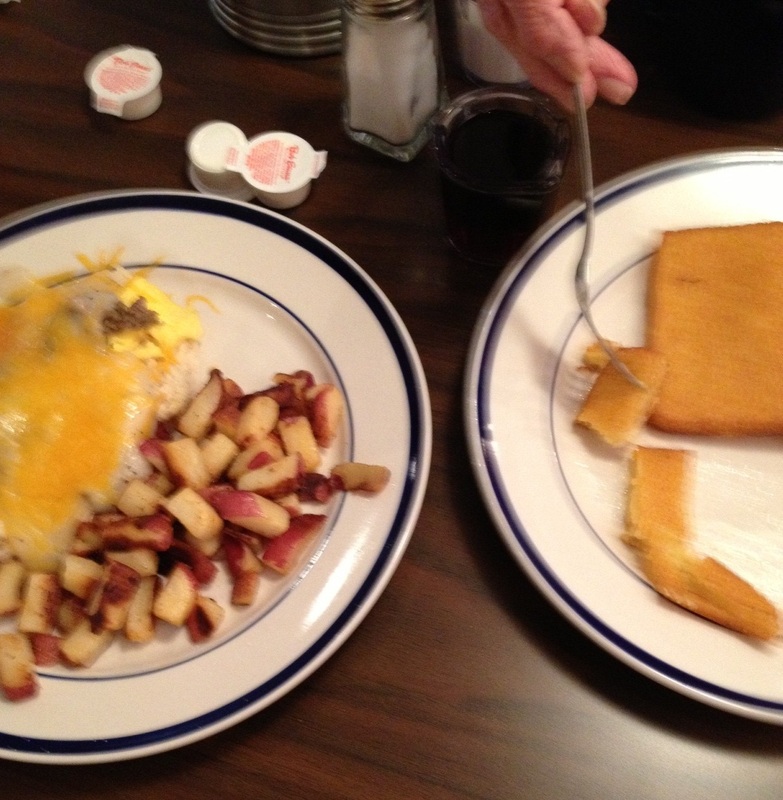 And, a part of me was thinking…. 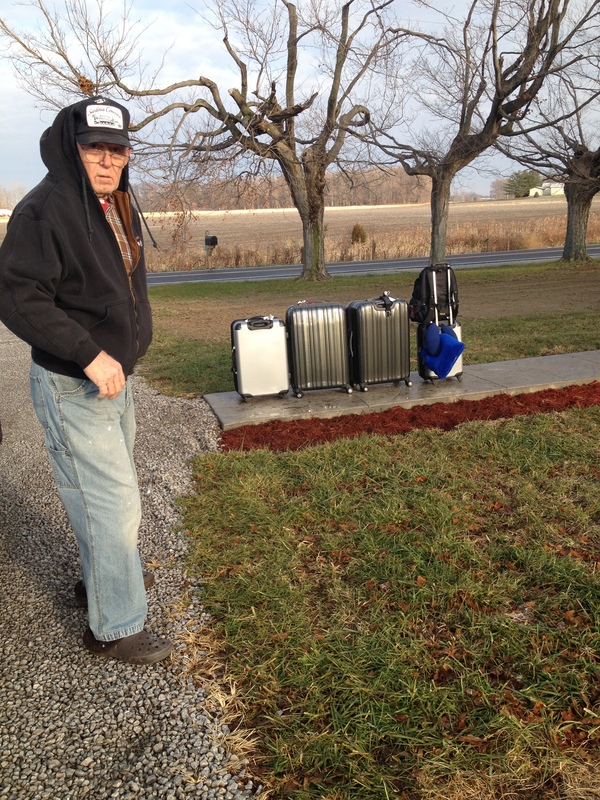 “what if there are NO PORTERS at the smallish Dayton Airport?? How will I manage all this?” – no worries – I had bungee cords – and a plan to lash them all together in two groups and pull them along behind me. What a mess of luggage. And, it’s COLD!! Mama snitching some of my fried cornmeal mush from Perkin’s. OOhh…,. Skyline. Home of my favorite 4-way bean! 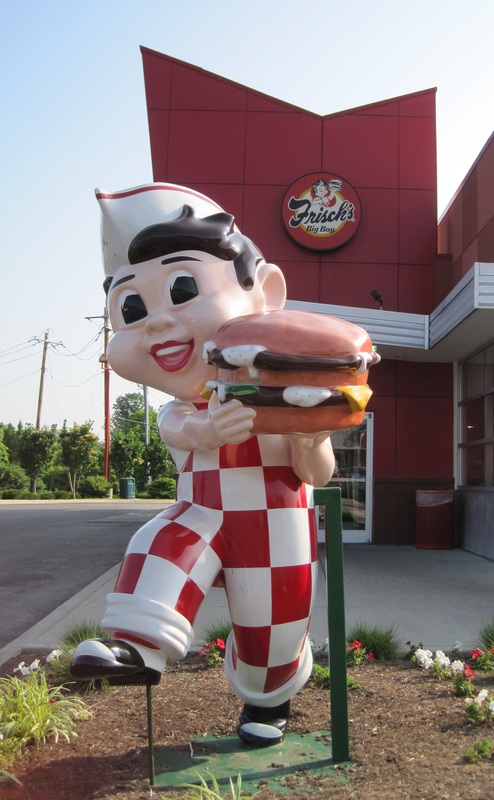 Frisch’s Big Boy – Daddy once sat next to Dave Frisch at a counter in a Frisch’s. 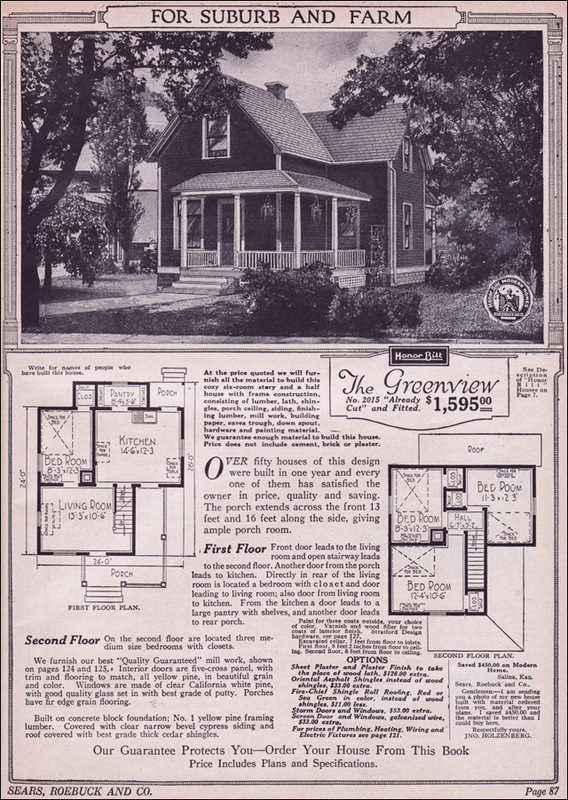 Plus, it was pretty cool seeing all the renovations they’d made to the house, it’s a 1921 Sears Catalog house – yup, the original owners looked at a Sears Catalog and said “That’s the house for us” and placed their order. 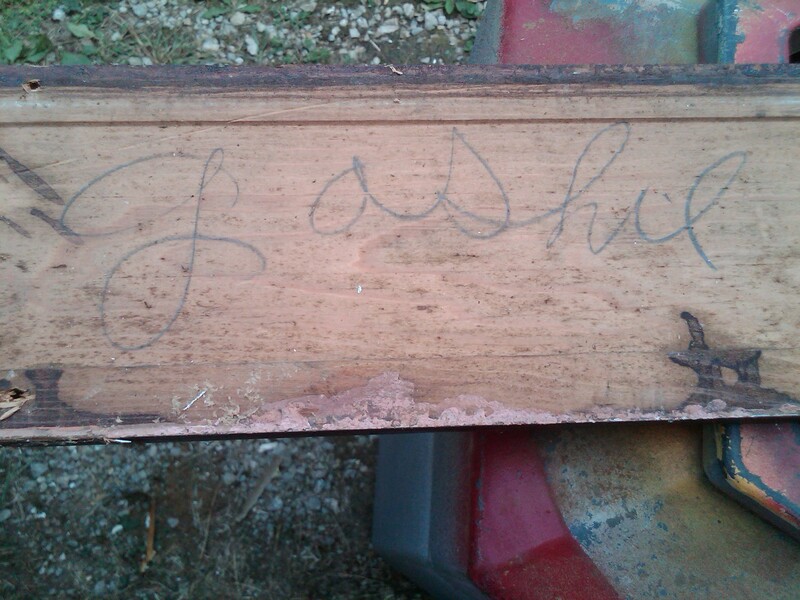 It arrived on flatbed railcars to the nearest railhead….. all the pieces were numbered by hand on the back with a grease pencil…… and the name of the original owners. Imagine getting a book of instructions and a #600 keg of nails to put your house together?? Amazing. Anyhow, I digress *again*….. I think it’s because it was so dang hard to drive off on that cold morning to the airport in Dayton….. but I know I’ll be back again soon. Probably will end up seeing Mama more often than when I lived in Alabama! 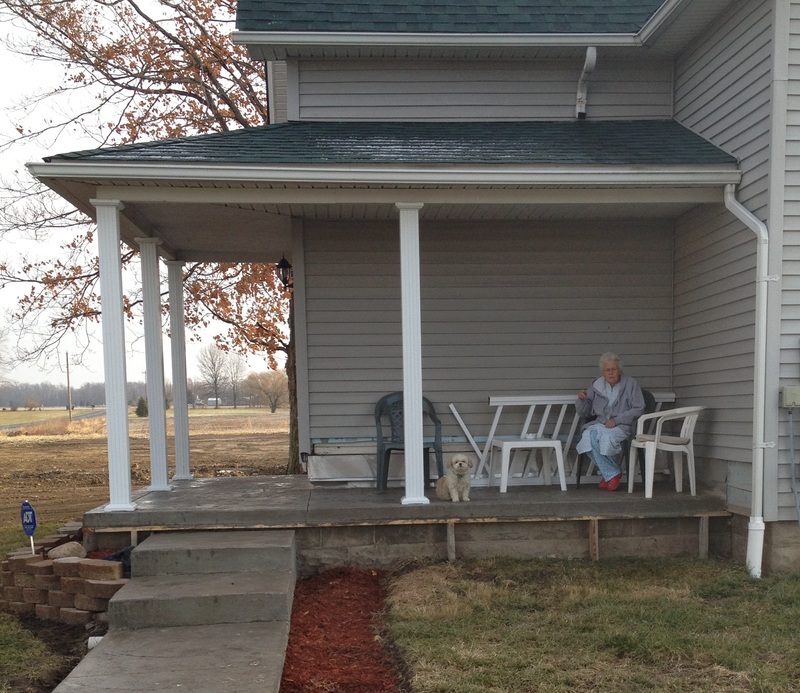 Drove off, waved goodbye to Mama, blew kisses, and started crying. *sigh*….. of course I did. The rental company gave me one. I oriented myself, planned a route, wiped the tears one last time and put that puppy in Drive. I know when I finally make the move, I will have my Mum and sister at the airport (I hope my best friend of 28 years can come too) and I know it will be hard to say goodbye – even though I know my husband will be waiting at the other end for me which makes the move better as it is a life with him I wish to build!